Her name reflects her birthplace; it is the old name for Addis Ababa. She was born after her mother lost two sons. She was born in Ethiopia when I was expecting our first child in California, USA. Her father was a follower of a witchdoctor; mine was a follower of Jesus. Her father stumbled about in darkness while raising his children; mine served the Lord Jesus as a missionary, bringing light to the southern regions of Ethiopia. When I was 23, I was finishing nursing school with my bachelor’s degree, and I was looking forward to marriage. When she was 23 years old, she was caught in a traffic accident. Her back was broken. Although she was living in the most modern city in Ethiopia, her health care was rather primitive. They tried to wire the pieces of her lower back into place and then sent her home. Almost 2 years after her accident her father, drowning in despair, committed suicide. Shewalem was plunged into despair herself. Her friend, also a follower of witchcraft, came to her. “I had a dream,” she said. She then described a dream of horrors. She predicted that Shewalem would die a horrible death. Can you imagine her condition at this time? Can you imagine the horror of living in primitive conditions, paralyzed in both legs, with both father and mother gone, having the responsibility of 4 younger siblings, dealing with a prediction that was void of any hope? Who could help her? God could help her. The Lord Jesus could redeem her, buying her back from the Evil One, giving her hope, restoring her body, providing for her in every way. In His wonderful sovereign grace, He sent a different friend to Shewalem. This friend knew the Lord Jesus. This friend introduced her to the Saviour. Can you imagine the joy of hearing the Good News…the Evil One has been conquered! Love is available! There is hope! We can be made stronger than our circumstances! God loves us!!! She readily accepted the love of Jesus, and her whole outlook has changed. No, her circumstances have not changed. She is still largely paralyzed. She still is alone in caring for her 4 younger siblings. 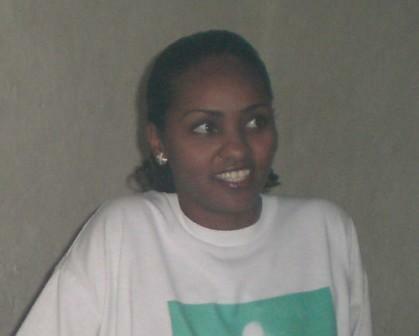 She still lives in a small little room in the city of Addis. She has crutches; she has a potty chair. Her room has a bed off the floor and a window. Somehow she gets some physical therapy several times a week. But she is smiling. Jesus shines in her. Just days before we left for our last trip to Ethiopia, we got an urgent email from one of our “sons.” “Please,” he wrote, “please, can you get this medicine for Shewalem. It isn’t available here in Ethiopia.” What was the medicine? It was something that has been used for many decades here in America, that is readily available, that is relatively cheap. It was a medicine that could keep her legs from spasm…a medicine that would make all the difference in terms of function, and would reduce her pain! In the mercy of God, I was able to get this medicine and it has worked marvels! Praise God that an unbelieving doctor (on a weekend!) was willing to help me get this medicine. But she still cannot walk. The doctors in Addis Ababa have said that they do not have the medical capability of doing the surgery she needs. She needs to have a re-working of the lower vertebrae, with anterior approach. They do not have the instruments, the knowledge base, the expertise, the anesthesia, etc. to do this. They have advised her to look beyond Ethiopia for the help she needs. In the developed world, this is a common surgery, done by most hospitals with an orthopedic unit. So we are laying this situation before you as her brothers and sisters in the Lord. But for the grace of our Lord Jesus, the life circumstances between you/me and her could have been reversed. The Gospel is about helping people. The Scriptures say we are to work with our hands to meet our own needs and the needs of others (Eph. 4:28). So I ask you: Are you a doctor willing to facilitate her care? Are you an orthopedic surgeon willing to help her? Are you associated with a hospital willing to connect her and streamline the bureaucracy? Do you have some coins in your pocket or funds in the bank or investments that have been blessed by God that you are willing to part with for her benefit? Are you willing to commit yourself to prayer for her? This will be a huge undertaking, but our Lord is able to perform what is in His heart if we are willing to be obedient. We do not know what God will do for her. We do not know what person He wants to bless through helping her. This is His work. He knows what He wants to do. Is he calling you, burdening you on Shewalem’s behalf? According to Ephesians 2:10, we were saved “unto good works.” The salvation He’s given us is not an end in itself…it is for the purpose of doing good works that glorify the Saviour. These good works have been appointed to each of us. All we ask of you is to please pray about her situation and ask our Lord if this is one of the “good works” that He as appointed for you from before the foundation of the world. If you sense His Spirit confirming this work for you, please contact us. If not, then we ask that you continue to lift her in prayer as the Lord lays her upon your heart.